ISO/IEC 20000 is the first international standard for IT Service Management Systems (SMS) which allows companies to demonstrate excellence and prove best practice in IT management. The standard ensures companies can achieve evidence-based benchmarks to continuously improve their delivery of IT services. ISO/IEC 20000, like its BS 15000 predecessor, was originally developed to reflect best practice guidance contained within the ITIL (Information Technology Infrastructure Library) framework. The adoption of ISO/IEC 20000 has grown quite rapidly in the international arena of IT service providers and it has become a competitive differentiator for delivery of IT services. ISO/IEC 20000 Part 1 is the Management Standard Specification and promotes the adoption of an integrated process approach to effectively deliver managed services to meet the business and customer requirements. ISO/IEC 20000 Part 2 is the Code of Practice and describes the best practices for service management within the scope of the standard. This workshop gives you an understanding of the key elements of the ISO/IEC 20000 international standard for IT Service Management along with the specific requirements of the Quality Management system. ISO/IEC 20000 has been developed in order to meet the needs of the wider international audience and to provide a common understanding of the management of IT services worldwide. ISO/IEC 20000 will enable organizations to benchmark their capability in delivering managed services, measuring service levels and assessing performance. It will also reduce operational exposure to risk, meet contractual and tendering requirements, demonstrate service quality and deliver best value. This workshop specifies requirements for the service provider to plan, establish, implement, operate, monitor, review, maintain and improve the Service Management Systems (SMS). The requirements include the design, transition, delivery and improvement of services to fulfill agreed service requirements. This workshop will help participants understand how to implement / audit the requirements of ISO/IEC 20000 for the organization. Anyone aspiring to understand the requirements for certification of an organization’s IT Service Management System (SMS) against ISO/IEC 20000 would benefit from this workshop. Those who are working or have worked in an IT Service environment or equivalent will find this particularly useful. 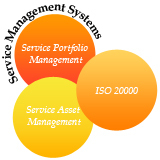 Prior knowledge on IT service management and the ISO 20000 series of standards is desirable.